Our final unit was on leaveners. 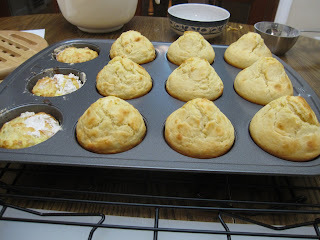 The first exercise focused on different measuring techniques for flour and sugars and how using measuring cups/spoons will get you different weights, so is less consistent than using a scale. 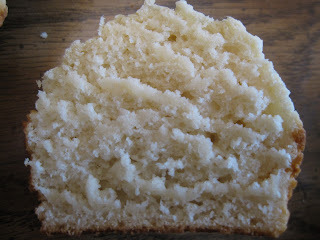 Experiment two was on yeast. We had to set up multiple bowls with water of varying temperatures and with varying things added. So cold water with and without sugar, warm water plain, with sugar, and with salt, and hot water. 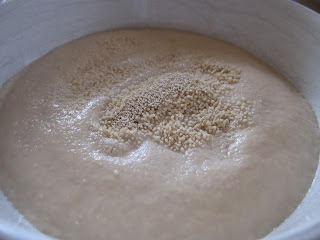 Then observe how the active dry yeast responded over time. Warm water with sugar works best, hot water kills the yeast, and all the others had little to no activity. The third experiment we used chemical leavener. When making muffins we had to dish out batter after various numbers of strokes. 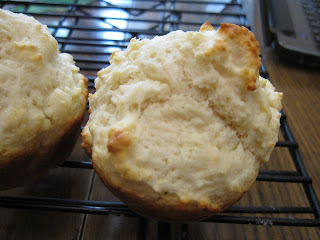 Then we had to make up a small batch with either no egg, no sugar, or using whole wheat flour. 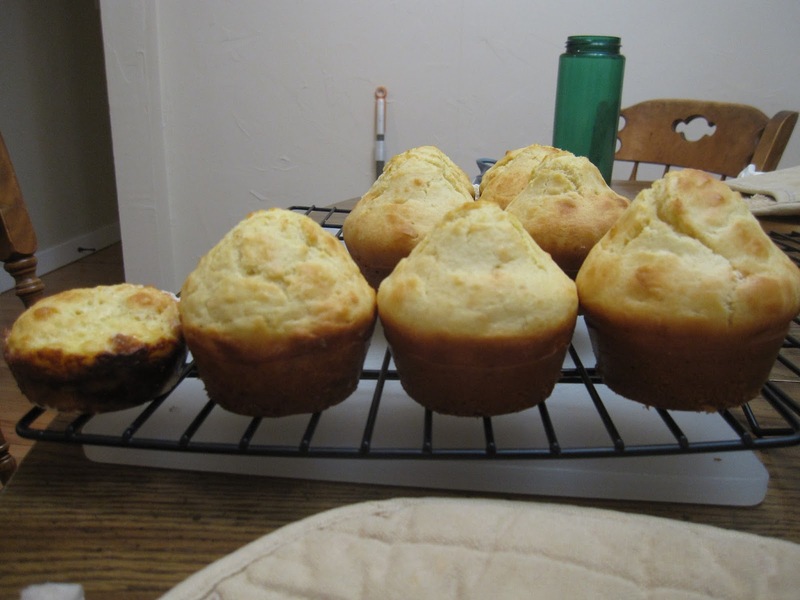 Obviously, putting batter in tins before the ingredients are fully mixed will result in sub-par muffins. This experiment also dealt with gluten development and how that impacts the final product. I did the no egg variation. 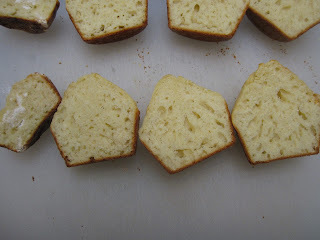 The no egg variation actually wasn't all that bad. Took less time to cook and the batter was really thick and not smooth at all on the surface when cooked, but the taste wasn't too bad. Our final project was to create our own recipe for a dish. We had to use at least 3 ingredients, each of which was supposed to demonstrate a principle that we'd studied during the quarter. I made what I called "Spicy Peanut Chicken and Vegetables over Brazilian Rice". 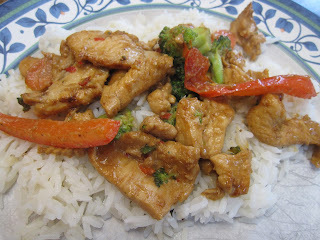 So just a peanut sauce/marinade, stir-fry the chicken and veggies and serve over rice. We had to serve it to ourselves and at least one other person and have everyone who ate it evaluate it for taste, texture, appearance, etc. Bring water to a boil. In a separate saucepan heat the oil. Add garlic and sauté until lightly browned. 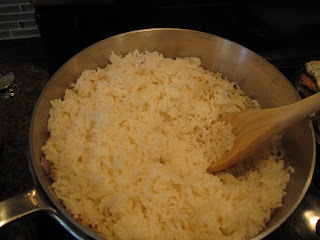 Add rice to pan and sauté until lightly toasted and somewhat translucent. When the water is boiling, pour it over the rice. Cover and simmer the rice 18 minutes. Turn off heat and let sit for 5 minutes. Food process the chilies and garlic (or crush with a mortar/pestle or bottom of a cup). 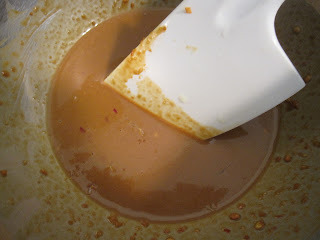 Add remaining ingredients and stir until combined. Make one batch for marinade, make another for extra sauce. 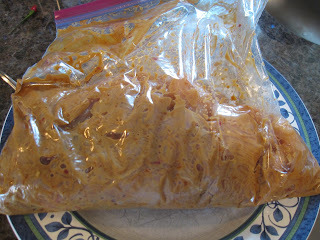 Combine marinade and chicken in resealable bag and let marinate in refrigerator for 1-3 hours. Heat skillet over medium-high heat. 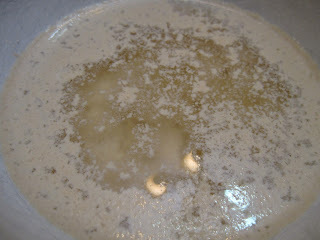 Add 1 Tablespoon canola oil to pan. Add chicken to skillet, cooking until browned, about 5 minutes. Remove chicken from pan. Add extra oil to pan if needed. 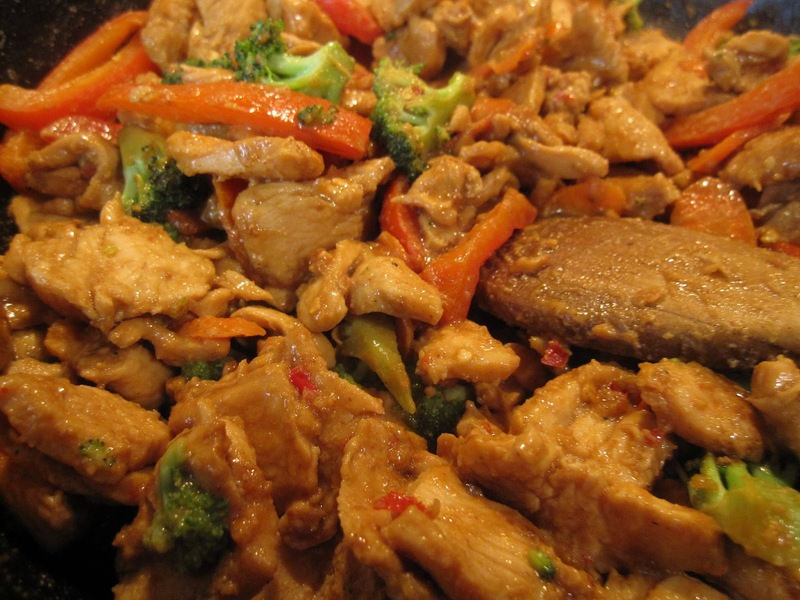 Add vegetables to pan, cooking until crisp-tender, 3-5 minutes. Return chicken to pan and heat through. Add extra sauce to pan, to taste. Serve over rice. For our report we had to include pictures and discuss our ingredient selection/preparation and the scientific principles employed. The sauce was tasty and the only thing I'd change is using more Thai chilies in future - once combined with the rice and other stuff the sauce loses a lot of heat. The broccoli is perfect for this kind of recipe because the florets hold sauce really well. Adding red bell pepper and carrots makes for a vibrant dish. Ryan's already asked for more of the peanut sauce to be made. Guess I'll have to have him practice making it this summer so he can make it during the next couple years if he wants to.